Bored with Beyond Retro? Always go in Absolute Vintage? 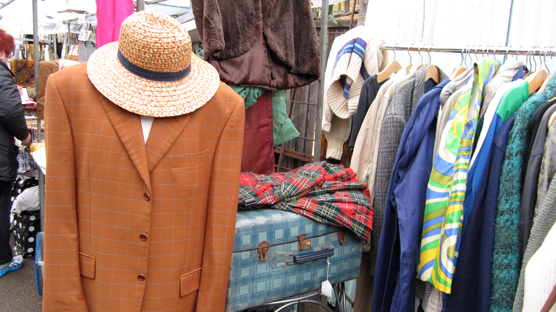 As much as I LOVE these Brick Lane vintage meccas why not take the Thrift-ola's route around Brick Lane one day featuring 8 hidden gems that might well become your new fave haunts. 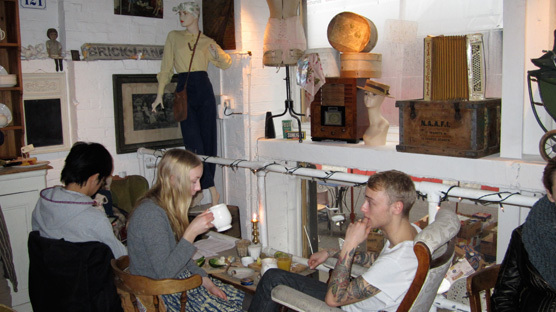 Step down a little alley off Bethnal Green road and hidden away in a railway arch is 10 Gales – a mix of fashion shoot space, café and vintage clothing boutique run by the dashing duo JJ & Ernesto. 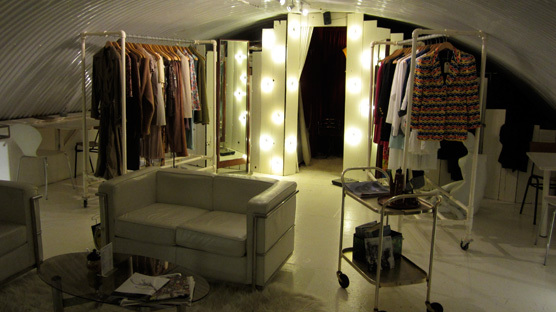 Take the staircase upstairs to the super cute tiny café with it’s chequerboard floor and see full length mirrors flank the central changing room where you feel like a starlet trying on their super select range of 80’s and 90’s vintage clothes. So what makes this secret haunt thrifty? It’s the little hairdressing salon out the back where East End gals in the know go to get their hair cut by Yuya or Asami for £5 to £15. Sweet. 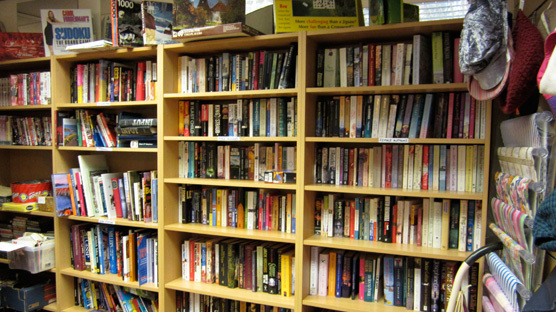 With new barnet ready to go we’re heading towards Columbia Road Flower Market and en-route it’s always worth bobbing into Spitalfields Crypt Trust Charity Shop, especially if you need a new book. It’s a homely, non corporate chazza so you never know what you’ll find and proceeds go to the homeless in the local area. Upon arrival at Columbia Road give the blooms a miss for today and scoot down Ezra street which runs parallel to it. In a courtyard you’ll find a happy little mix of stalls selling second hand goods. Within a few moments of chatting to the stallholders who all know each other by name, you feel like you know them all too. Shaun, the stalls manager, has run his dapper menswear stand there for the past 15 years. My favourite stall is run by Jo in the corner who sells fun, bright, novelty kitchenalia, homewares, greetings cards & bric-a-brac. Only open on a Sunday from 8am til 2pm. 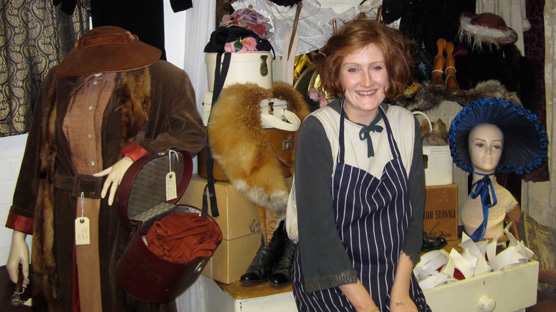 Turning back onto Columbia Road, next to the Birdcage pub you’ll find Vintage Heaven. Never before have I seen a second hand store so beautifully set out. The treasure trove specialises in kitchenalia and homewares with multiple china dinner services all separated out according to design and colour, which makes it so easy to pick out a whole set. There is a *huge* linen selection and row upon row of crockery & bric-a-brac. Owned by the admirable Margaret who spending hours lovingly polishing every piece and every surface to make sure everything stays fresh. Margaret’s top tip for visiting her store is to try and come on a Saturday as she brings in new things every Friday and it’s before the Sunday scrum. Wink, wink. She’s assisted by the lovely Hannah who works there after visiting the store 6 months ago and falling in love with it. The Cake Hole Cafe inside Vintage Heaven. If at this point you’re feeling a little bit peckish then I whole heartedly recommend the Cake Hole Cafe down the stairs behind the shop and run by Margaret’s daughter. If it’s not yet snack o’clock then do check out their website for the upcoming secret supper club Jimmy’s Dinners and even more squeal-worthy are the forth coming Fondue evenings. Retro brilliance. Walking back through to Bethnal Green road, just before we go onto Brick Lane go & check out Le Grenier which translates as ‘The Attic’. You’ll wish your attic looked like this! 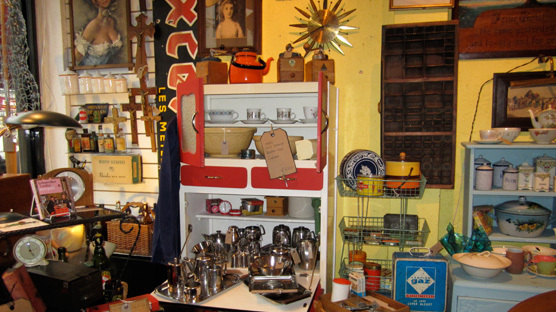 Stuffed to the rafters with 40’s to 70’s furniture, homewares, clothing and accessories. Jean-Louis sources stock mostly from the UK and twice a year from France. I love the attention to detail shop owners Jean-Louis from Paris and wife Yuko from Japan pour into the store including hand written luggage labels for most pieces detailing the item’s history. Righty-o, are you ready to turn onto Brick Lane? Great, but we won’t be stepping foot inside any of the stores on the lane itself! Instead we’re going to take the first right onto Bacon street. 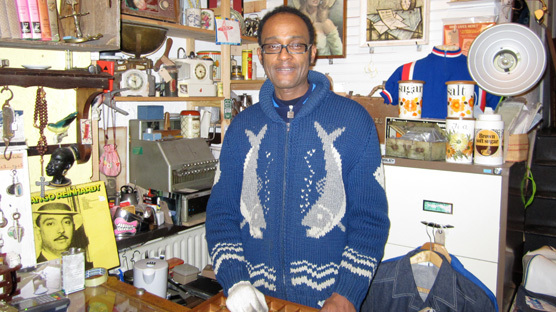 In a very unassuming archway is the Second Hand store which is run by a husband and wife team Des & Lorraine who do house clearances. This place can turn up a real gem or two, but you gotta be prepared to dig. Every type of second hand stuff is piled high, hanging from the ceiling and why not open a random box or two for the most surprising finds. Open everyday 11am to 5pm. 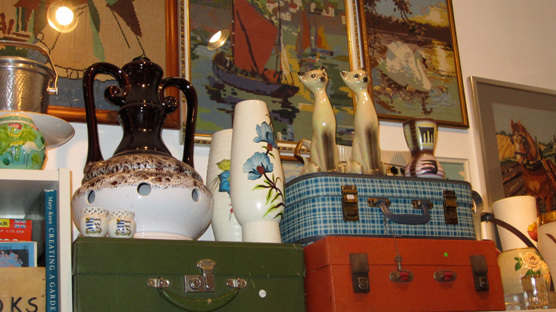 Go next door to the Vintage Emporium and through the entrance way which says ‘Welcome Home’. 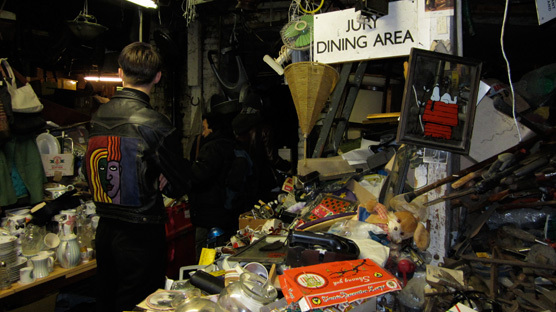 In a world of many, many ‘vintage’ shops on Brick lane, owners Jess and Oli decided to specialise in stock aged between The Victorian Era and 1950s. The Vintage Emporium Cafe is open everyday 10am to 10pm. 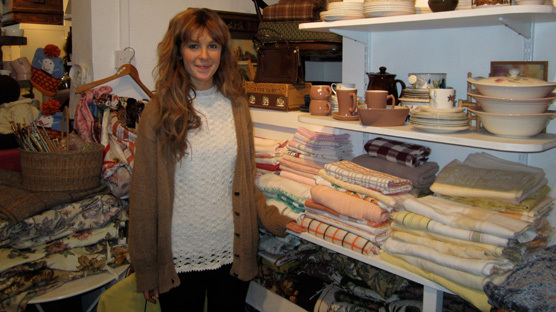 Owner Jess sits amongst her beautifully displayed vintage collection. I first met Jess when she had a stall at the Thursday antiques market in Spitalfields where I purchased one of my most treasured floral frocks. 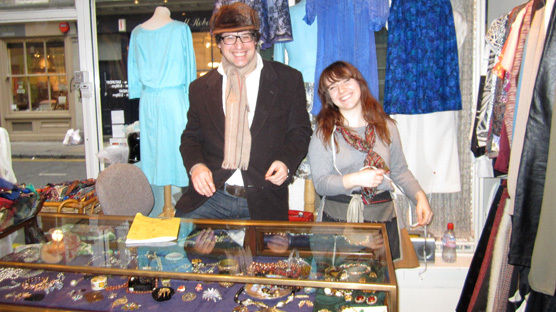 I’m so pleased the duo have now opened what I believe to be the jewel in the crown of vintage shops in Brick Lane. 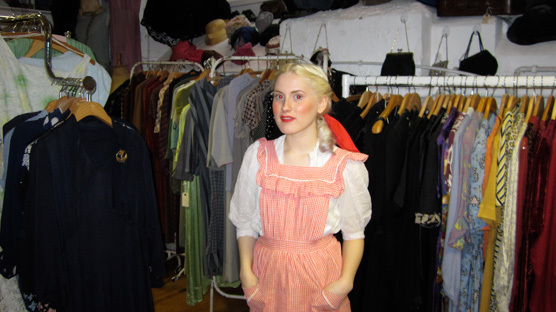 Weekend girl: Harriett Henderson – studies creative writing and journalism. Jess and Harriett are on hand downstairs to guide you through the rails and rails of hand picked clothing and accessories. They both have superb knowledge and a genuine love of the pieces. So what makes this place thrifty? No, you’re not going to find a frock for a fiver but what you will find is a rare and beautiful garment that is a genuine investment piece for your wardrobe. It will cost you the same as a dress in Topshop or Urban but look after it well and this is a frock for life that no other gal will be wearing about town. We have one last hidden gem on our route, simply called The Shop. 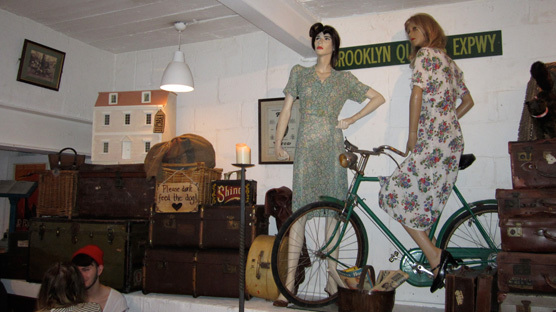 It is Brick Lane’s original vintage store opened long before the hipsters hung out here. Back in the day it only opened on Wednesdays and Sundays, but I can now thankfully report Sharon opens the store everyday. Hurrah! 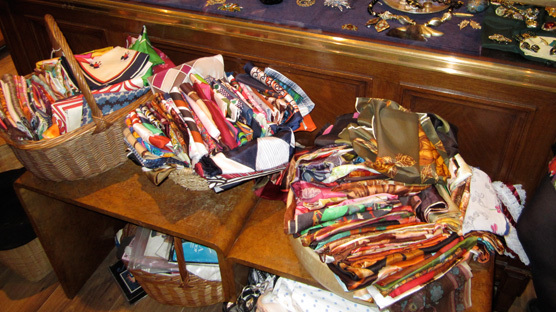 The store carries over 1000 vintage scarves which all feature a good design or print element. The first thing you are likely to spot when walking into this place is the sheer number of wicker baskets of folded textiles, silk hankies and scarves. 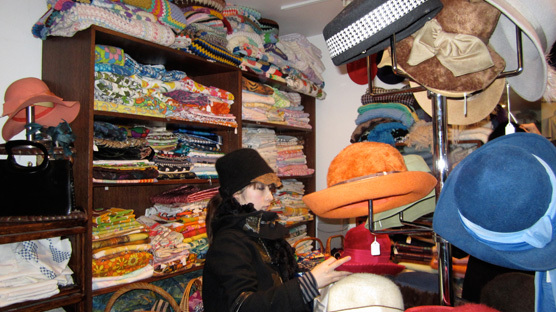 They specialise in textiles but also have racks and racks of handbags, hats, clothing & zillions of vintage aprons. Then truly shock yourself by checking out the price tags – mega affordable! 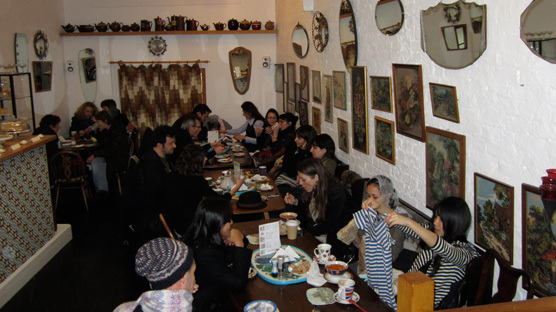 Sharon’s son Michael runs their warehouse on Hackney road which is not usually open to the public, but can be opened by appointment, mainly for textile designers. The website is in progress and will feature a blog with posts on how to wear second hand and how to mix vintage with contemporary fashion. They price stock very fairly as Michael tells us: “We are here to sell stuff, not operate as a museum”. A sentiment Thrift-ola also holds close to it’s heart.